Here’s what’s up in the world of TV for Sunday, April 9. All times are Eastern. 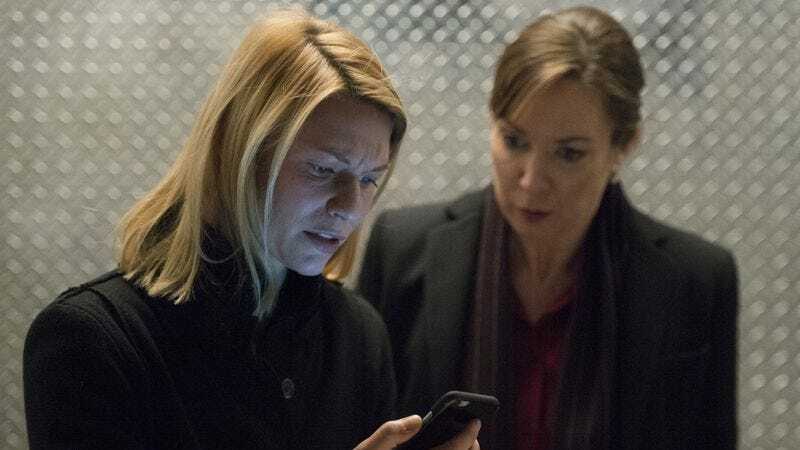 Homeland (Showtime, 9 p.m.): This long-running (especially for Showtime) show concludes its sixth season tonight. Joshua Alston has found this season—which saw Carrie Mathison (Claire Danes) living in Brooklyn and dealing with the effects of the U.S. presidential election—to be fairly uneven, averaging around the B-/C+ range. But at least it’s timely, as Joshua pointed out last week: “For a show nearing the end of its anemic sixth season, it’s arguably never been more prescient or relevant to the current state of politics.” Let’s see what he’ll think of the finale. The summary doesn’t help us much: “Pieces fall into place.” C’mon, Homeland, who do you think you are? Mad Men? Legion? Don’t worry, Homeland will eventually return for seasons seven and eight, joining an elite group of long-running Showtime scripted series like Weeds, Dexter, Shameless, and Californication. And you know Rick Springfield tried as hard as he could. Crashing (HBO, 10:30 p.m.): This new Judd Apatow-produced series, which stars Pete Holmes as a guy who sleeps on friends’ couches while he tries to get his stand-up career off the ground, also wraps up its season tonight. Andrea Reiher has liked it a bunch; in fact, the lowest grade Crashing got from her all season (so far) is last week’s B, but that’s probably Rachael Ray’s mom’s fault. She is always messing stuff up. This list is shorter this week because Fox is all reruns tonight. Who does that? Feud (FX, 10 p.m.): Just try this show out. We refuse to beg. Match Game (ABC, 9 p.m.): Since Time After Time was so unceremoniously yanked from the airwaves, ABC has decided to fill this Sunday-night slot with more viewings of the delightful new Match Game. A somewhat unflappable Alec Baldwin hosts as contestants try to match answers with famous people; tonight the six-celebrity panel consists of Adam Carolla, Jenna Fischer, Tyson Beckford, Caroline Rhea, Jay Pharoah, and Ana Gasteyer. We would prefer Tituss Burgess, but we can’t have everything. But it’s a fun show and most of those silly double entendres go right over the kids’ heads. We hope.